High quality pure cotton water washed canvas made. The Liner size: 160mm × 110mm × 190mm. Can take off the pad as casual shoulder bag. The Bag Size : 170mm × 130mm × 200mm. Simple design for functionality, durability and protection. One bag that adapts to your gear and lifestyle, no matter where you go or what you're carrying. In doing so, we reimagined nearly every aspect of this classic bag style, from the MagLatch™ closure, to the origami-inspired FlexFold™ dividers, to the weatherproof expandable protective shell and hyper-adjusting internally padded seatbelt strap. Box contents: Zoom Case. Light inner colour. We will always help you to have a 100% positive happy buying experience. High quality pure cotton water washed canvas made. The Liner size: 300mm × 130mm × 200mm. 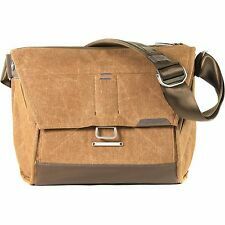 Can take off the pad as casual shoulder bag. The Bag Size : 180mm × 380mm × 280mm. The VEO DISCOVER 15Z compact zoom bag sports a streamline design to ensure the minimal carrying bulk when carried on your shoulder, across your chest or transported in another bag alongside a full gear set. We partnered with renowned adventure traveler/photographer Trey Ratcliff to create one bag that adapts to your gear and lifestyle, no matter where you go or what you're carrying. In doing so, we reimagined nearly every aspect of this classic bag style, from the MagLatchTM closure, to the origami-inspired FlexFoldTM dividers, to the weatherproof expandable protective shell and hyper-adjusting internally padded seatbelt strap. A strong, padded, leather-reinforced handle has been added to the top cover to provide extra comfort and a secure grip. Two spacious, expanding front pockets provide extra capacity for storing lenses or accessories, and incorporate studs that can be unfastened or closed for increased versatility. The Brixton is most comfortably worn cross-body. The ONA Brixton Bag. ONA uses superior materials, such as full-grain cowhide leather, waxed cotton canvas, solid brass, and closed-cell foam. This is the essence of photography and style. TENBA COOPER COLLECTION. The Cooper 13 DSLR was built to accommodate a DSLR with 2-3 lenses (up to 70-200mm 2.8). There are tons of other reasons to love this amazing bag. 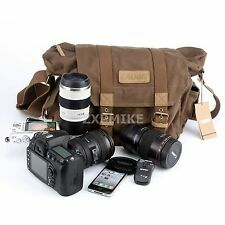 DSLR with 2-3 lenses (up to 70-200mm 2.8). Passend für Camcorder: Pocket. Passend für Camcorder: Standard. The soft shoulder pads made of leather also ensures increased comfort and grip on the shoulder. It opens up the flap of the bag, you can see side two keys that protect the Interior of the bag from rain and dirt. Handmade Italian leather that has a wonderful, well-traveled aesthetic. Label: Tamrac. Colour Brown. Colour Spectrum Brown / Khaki. Condition: new. We will do so too. We'll strive to resolve your problem. Handle Yes. We will dispatch the product after receiving the money. And should you find yourself in a downpour, you will be able to stay dry with our total coverage rain cover. Havana 21 BLUE. 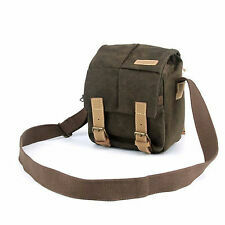 Dual Purpose Benefit - Photo Bag or Daily Bag, suitable for DSLR/CSC. Integrated Storage Pocket for 7" tablet. Case carrying style: Belt, Shoulder strap. Type: Shoulder case. Depth: 11.4 cm. Colour of product: Black. For style and protection, the bag is constructed from water-resistant RuggedWear canvas. Water-Resistant RuggedWear Canvas. Material RuggedWear waxed canvas. THIS IS A GENUINE ITEM MANUFACTURED BY DOMKE . The VEO DISCOVER 22 is a compact shoulder bag that fits a DSLR with lens attached, 1-2 lenses, a flash, essential accessories and a mini tablet. 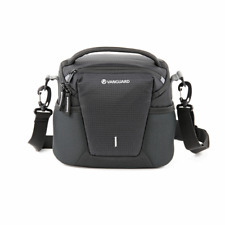 Key Features: Vanguard Veo Discover 22 Shoulder Bag. Stay hydrated - water bottle side pocket.